Material handling insights, you won’t want to miss it. Excellent articles, videos, photos on topics like #warehousing, #forklift trucks, #logistics and so much more. The 10/20/30 Rule of PowerPoint: Does It Still Work? Ensuring that your freight gets from point A to point B in an efficient and cost-effective way is our focus. A fire that could have been “bubbling away for days” inside Blenheim’s Waste Sorting Center is now under control. 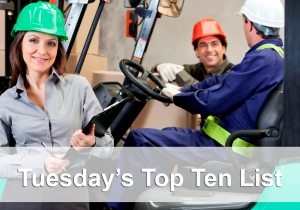 With more than 92 fatal work injuries occurring in the U.S. each week, #forklift #safety training is a priority. But it isn’t always effective as it should be. Here’s why. Proper maintenance checks for your dock and door, motive power, storage & handling equipment are essential to promote efficient warehouse operations. Near Miss Walk into the Path of a #Forklift#Forklift traffic should be separated from other workers and pedestrians where possible. Amazon is now making investments into French robotics firm Balyo in order to gain access to technology that can turn regular #forklift trucks into self-driving forklifts.